Mohamed Ayman Shaweeka a 20 years old soldier in the Egyptian Army died after hugging a suicide bomber, before blowing himself up with an explosive belt in an Egyptian army troop. 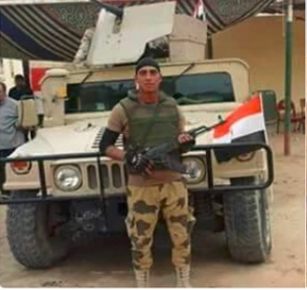 Mohamed the young Egyptian soldier has chosen to die voluntarily without any hesitation, he disobeyed the orders of his commander and protected his colleagues from the suicide bomber. This happened two days ago, during a raid launched by army forces on a terrorist nest in Zareh Al-Kheir village, south of Al-Arish city, in the North of Sinai, When soldier Mohamed observed one of the terrorists hiding in a Bedouin nest and was getting ready to blow himself up with an explosive belt towards the Egyptian army troop. Mohamed ran towards the suicide bomber and hug him before he blew himself up, despite his commander direct orders and his colleagues screams of staying away and backing off, but Mohamed was only listening then to one voice, the voice of the duty and the sacrifice. This is not the one and only story of sacrifice and heroism, this is just one story of many other stories that Egypt is witnessing in its war against terrorism. Mohamed is one of many other Egyptian army men who are doing their duty in silence, they are the unknown soldiers who protect the country, their colleagues and Egyptians with their own blood and lives. 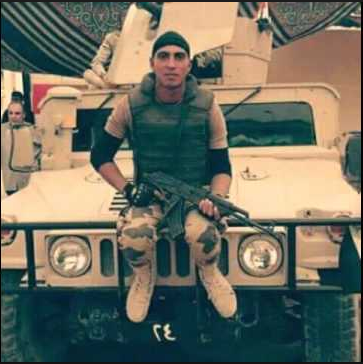 Mohamed Ayman Shaweeka the 20 years old young man, was a soldier in the Egyptian Army. The Egyptian Army that is described by the rented wailers of foreign media, press and international human rights organizations and the Muslim brotherhood terrorist organization, as “mercenaries, killers and assassins, who are trained to kill innocents”! Well, this is the Egyptian army men that you are not being told about. This soldier’s sacrifice is a message from “Mohamed” to the entire world, Mohamed fought terrorism with braveness and didn’t run away to save his own life and he disobeyed the orders of his commander and has chosen a horrible shocking way to die, while we hear extremist voices in this world, mixing and relating Islam and Muslims with terrorism. Those who consider all Muslims are the “usual suspect” and terrorists. Extremist and irresponsible voices in the world who are calling to ban Muslims from entering the US or Europe, who are in reality spreading anger, extremism and hatred between Muslims and Christians, instead of admitting that terrorism is spreading in the west, because when we called them terrorists in a country like Egypt, the western governments and the human rights organisations called them “freedom fighters” and “victims of oppression and dictatorship”. Egypt never stopped warning the world from those terrorists, who committed terror attacks and killed citizens, army and police individuals in their own countries, and went and got safe haven from Europe and the US, under the claim of being jailed with framed charges or that they were exposed to oppression and torture. Now, what we were constantly warning the west from, is happening. We kept saying, those you consider victims of oppression, will turn their own swords towards your heads one day soon, and harboring terrorists begets terrorism. But no one is listening. I doubt so much that the western countries are really launching a serious war against terrorism. Just search for the source of money and finance, just search for the type of weapons terrorist groups possess in hands, and you will find out who is really supporting terrorism and who is fighting it. The US and their allies are claiming that they are in a war with terrorism, while the truth is, it’s always just a matter of political and strategic interests, and as long as they are not going to call spade a spade, and as long as there are countries out there shaking hands with statelets like Turkey and Qatar who are supporting and financing terrorism with money and weapons, there is no real war against terrorism, but there is a bullshitting! It is really sickening to hear that there are countries out there who are the sponsors of terrorism in the world, and they are members in NATO and in addition they are joining an Islamic military coalition to fight terrorism! As long as there are Arab and western countries who’s only interest to get rid of and assassinate the Syrian president and get down his regime, to assist what they call “ARMED OPPOSITION” in Syria, there is no real war against terrorism. As long as the world doesn’t agree on one definition for “Terrorism”, there is no serious war against terrorism. As long as an international terrorist organization like the Muslim Brotherhood who live and enjoy a safe haven in more than 80 countries in this world, and western countries refused to add them to the terrorists list, there is no serious war against terrorism. As long as there are many terrorist groups in Libya including ISIS, and they are getting weapons and money so easily, while the United Nations refused to arm the Libyan army or what’s left of it, and is calling all parties in Libya for a silly national reconciliation and unity based on a farcical political solution, then there is a united political prostitution taking place, and not a united nations in war against terrorism. who is really fighting terrorism are real men, and those real men are like “Mohamed”, and Mohamed was a soldier in the Egyptian army, and the Egyptian Army to those who don’t know, is the factory of men.